The Revel arm leverages powerful, smart actuators with clever engineering to make a low-cost 6DOF robotic arm that has features that you only see on arms 5x the price. Combine this with the fact that Revel is U.S. made, constructed out of aircraft grade aluminum, while keeping a weight under 3kg and a price under $6500 USD and an ever-growing library of accessories; robotics has never been more accessible. 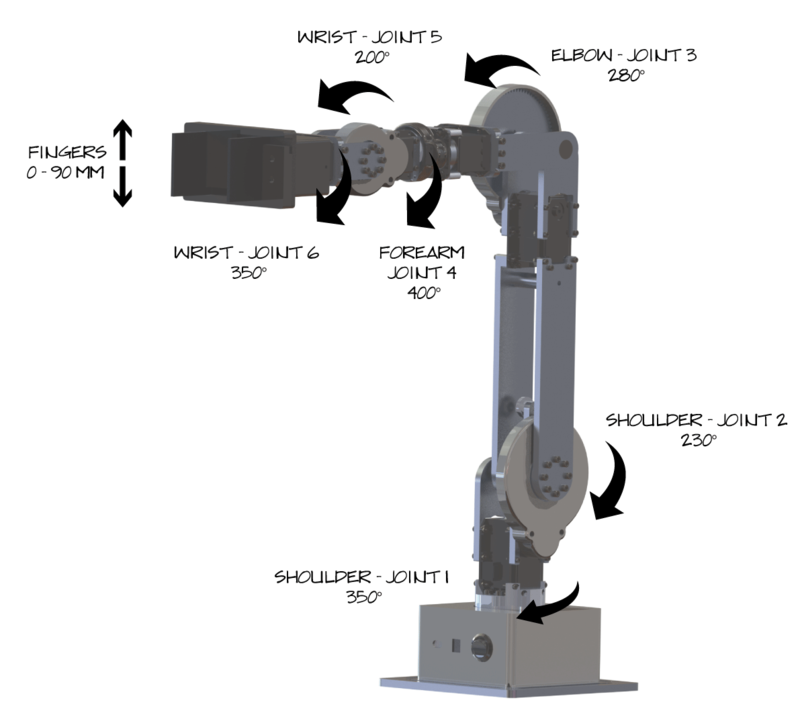 The Revel Robot Arm was specifically designed to be flexible and easily modifiable for custom solutions, while maintaining advanced software features. This gives universities, educators and small businesses the tools that would allow them to integrate robotics into their operations. Revel is ready-to-run on the ROS ecosystem with our ROS drivers allowing for quick and easy integration into existing robots or research projects. Orders have a 2-3 week lead time. Revel is powered by Robotis’ series of Dynamixel smart actuators. These servos pack a lot of flexibility and power in a small package. Dynamixels can be controlled through C, Python, Java, Matlab, and Labview, and are highly accessible for power users on a firmware level to tweak and tune. Each actuator outputs position, velocity, acceleration, current, torque and voltage data in addition to system monitoring data like motor temperature. The ROS driver outputs data at 100 Hz through TTL Dynamixels with faster output possible through the RS-485 Dynamixel option. The flexibility of the actuators in combination with our ROS driver allow for many control modes of the Revel robot: cartesian velocity, joint velocity, position control and torque control. Revel is manufactured and assembled in the U.S. using aircraft grade aluminum to produce a high strength to weight ratio. Its low weight, with the low power consumption of its Dynamixel motors, allow Revel to be easily integrated into existing mobile platforms with a minimal footprint. Revel is engineered to make customization for your project simple and inexpensive. Revel’s parallel gripper can be easily removed for a custom solution or an off-the-shelf gripper that you need for your application. Different applications demand different finesse. Revel’s parallel gripper has hot-swappable fingers, allowing you to choose the finger shape and size that meets your needs. With your order of a Revel Robotic Arm you’ll get everything you need to get started. Revel is backed by a 30-day money back guarantee. If it doesn’t fit the requirements for your project, simply send it back for a refund. Keep it longer than 30 days? We think you will! Which is why Revel is covered under a manufacturers warranty for a full year. Watch the Revel Robotic Arm in Action! A picture is worth a 1000 words. Check out the videos below to see Revel in action. You can find robot manuals and technical drawings on our support page and robot drivers on our github page. Can’t find what you need? Reach out to us and we’ll do our best to help. If you’d like to have a conversation about the Revel with one of our engineers fill out the form here, or email us at sales@svenzva.com. We’ll reach out to you as soon as possible!